Solar Energy | Moonlight Electric Services, Inc.
What is the benefits of solar? Discovering solar energy dates back to the late 1800’s, and finding incredible purpose since the 1950’s when used to power spaceships and satellites. Nowadays solar systems produces energy for private and commercial use by using layers of silicon cells that instantaneously convert light into energy. By having your own PV solar system, you generate clean and free electricity from the sun to power your home! Solar power is a renewable, sustainable, energy source. It provides strong utility grade, clean power without the dependence on fossil fuels, coals or gas which are harmful to our environment. Solar electric systems are very reliable. They have no moving parts, Very little is needed to maintain them other than an occasional spray off with a hose. The panels are mounted on your roof and convert sunlight into DC power that flows to an inverter, the inverter converts the DC power into AC power that energizes your home, it’s that simple. Solar power produces no emissions unlike much of today’s utility-supplied power. And best of all, once the system has paid for itself, which only takes a matter of years, you will enjoy decades of clean sustainable power – free and clear. We take full care and respect to you, your home and your project, our mission is to treat each and every one of our clients with honesty and integrity and to make your solar installation project worry free and beneficial to you for many years to come. Stop throwing your hard earned money away at renting or leasing your energy, we can help you make your home more efficient and with rebates and 30% tax credit on a purchased system, now is a great time to become energy independent! In California, where the sun shines almost daily, going solar is a smart choice. Refer a friend and you will receive a $250 gift card with every installed system you refer. Call us today to start your energy savings! The complete process is on us! We take care of everything for you from beginning to end. The process starts with us analyzing your usage history, and a complete site inspection to look at ways of making your home more energy efficient. We inspect the condition of the roof as well as the main electrical panel, roof layout and shading factors and make recommendations needed for a high producing solar system. We customize your system to fit your roof space, usage and budget and give you a free and simple quote that accurately defines all of the equipment and the full scope of work so that there are no surprises or hidden fees. full guarantee/warranty details are available upon request. We file all the necessary paperwork to obtain utility rebates and interconnection agreements as required by the utility companies. Upon your acceptance, we will come out and measure out the roof space and create a layout so our team of electrical engineers can design and engineer your solar system. We will submit the plans to Building and Safety and Fire marshal ( as well as HOA if applicable) for review and permit approval. Upon approvals, we will schedule an install date with you, for the most part we do not need access into the home as all of our work is done outside, unless we are running the conduits in the attic space or installing the inverter inside the garage. Our team of installers are experienced and careful, using high quality, specifically made for solar materials, we attach the solar system on the rafters and water seal using high grade roofing sealant materials and sealed flashings to ensure no leaks. Each solar panel is tested before it goes up on the roof to ensure that it is functioning perfectly, our highly experienced electrician will make the connections from the solar array to the main electrical panel and test the system’s production and connections. Once the system is installed, we contact Building and Safety, request an inspection and meet with the inspector on your behalf to obtain a signed final on the permit. Then we submit that to the utility company to obtain a Permission To Operate, sometimes the utility company takes a while to grant the PTO due to their scheduling, but we are diligent at following up continuously to expedite that process. Once your solar system is given the PTO, you will be on your way to energy independence, you will be a green energy produce, and you will save lots of green! We are available anytime to help you with any questions or assistance you may need. 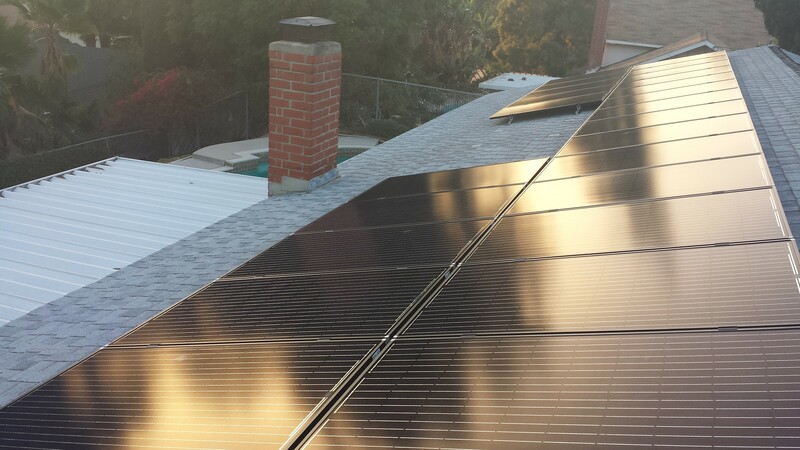 By installing one of our custom solar systems you can produce enough energy to power your entire household, leaving you with nothing but a small meter fee every month. As an incentive for households to make the switch to clean energy, our government offers a Federal Tax Credit for the purchase of a Solar energy system. This tax credit will contribute up to 30% of the cost of your system. By having an owned solar system on your roof it will increase your home’s property value as potential buyers will pay more for a home in which they have virtually no electric bill. Studies have also shown that homes with solar sell 15% faster than homes without solar. Conventional energy costs in Los Angeles have been going up 10 % every year for the last 3 years. 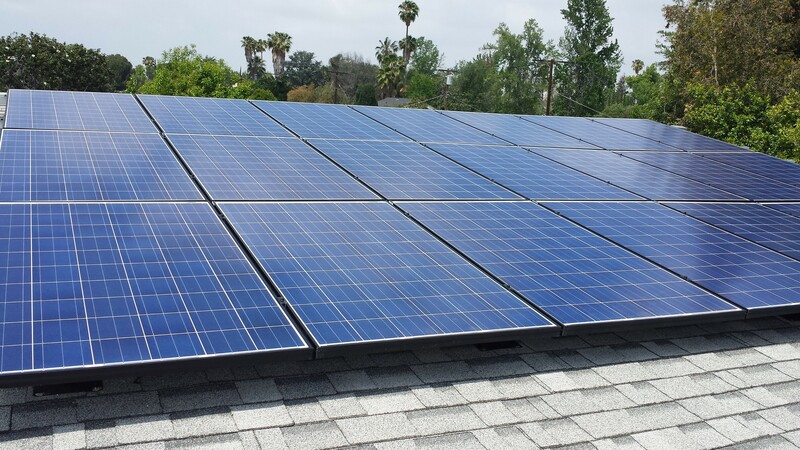 While conventional energy costs are skyrocketing, you can lock in your costs for the next 30 years by producing your own energy with your custom solar system. If you could have locked in your cost of gasoline at $1 per gallon 30 years ago would you have done it? Solar reduces your carbon footprint as well. The average American household generates 7.4 tons of carbon dioxide per year through electrical use. Installing solar reduces our country’s reliance on foreign and nonrenewable energy sources. Switching to solar energy is a great decision for your household, our community, and our earth’s future. Our team of installers are experienced and careful, using high quality, specifically made for solar materials, we attach the solar system on the rafters and water seal using high grade roofing sealant materials and sealed flashings to ensure no leaks. Each solar panel is tested before it goes up on the roof to ensure that it is functioning perfectly, our highly experienced electrician will make the connections from the solar array to the main electrical panel and test the system’s production and connections.